Budds' Mazda | Blog | We Won! Budds’ Mazda is pleased to announce that not only we’re we considered for a DealerRater award, but we won in two categories! With 162 Lifetime Reviews, and a 4.7 overall star average, Budds’ Mazda took home “2018 Mazda Dealer of the Year” in Ontario. We are proud to be one of the top-rated Mazda Dealers in the province! We also took home the “2018 Consumer Satisfaction Award” for Ontario as well! A big thank you to all staff for the hard work you do on an everyday basis. We would also like to thank customers for taking the time to give us feedback. It is greatly appreciated, so we can help give you an even better experience. Details on how the score is calculated is below. Once again, thank you to staff and customers, and we hope we can score again next year! To read our reviews, click here. 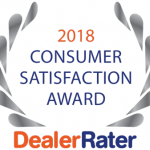 DealerRater’s Dealer of the Year Award Program recognizes a select number of car dealerships throughout Canada and the United States for excellent customer satisfaction as expressed through customers’ online reviews posted on DealerRater. The Dealer of the Year Awards will be given to car dealership that have the highest PowerScore™ in their brand (Mazda) category, both at national and provincial levels. Test drive a Budds’ Mazda vehicle today!